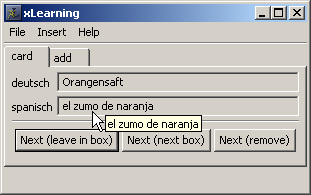 xLearning is a neat little Java-Program which helps learn by heart for example phrases or vocabulary. Actually I developed this for myself for the above reason and trying out SWT. Now I think it is worth sharing with others. I tried to make the installation as easy as possible, but because of native requirements (swt and database) it works best with windows. Any recommendations or notions are welcome always. XML-import/export and VT2-import (no export) is available. In the import-wizard (File -> Import) you are able to choose where to import which entries and whether they should be shared (if they already exist). 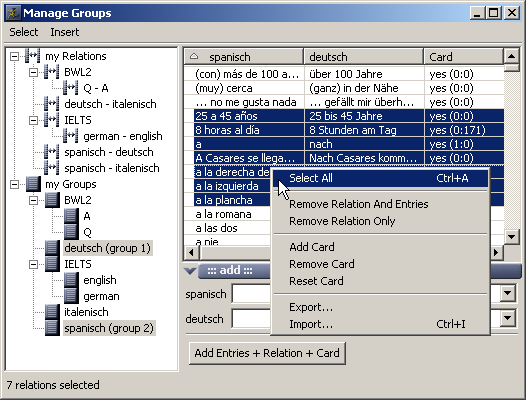 The export is available in the group-manager at different context-menus (for relations). You can download MySQL at www.mysql.com. Create a an empty database and enter the driver and url when asked or modify xlearning.properties (will be created if it does not exists already). You can download HSQLDB at hsqldb.sourceforge.net. But I reconized that 1.7.2 does not accept the CREATE TABLE-statement, so you better try the version 1.7.1. Enter the driver and url when asked or modify xlearning.properties (will be created if it does not exists already). However, I am not sure this is currently working probably because my harddisk gave me a headache again and I cannot test it well anymore.